When I remember the thundering and inspiring words of the leader of the Indigenous People of Biafra, and the director of radio Biafra and Biafra TV, Mazi Nnamdi Kanu, who is now a prisoner of conscience (POC) in the contraption called Nigeria, it makes me see how imminent the restoration of Biafra is. During his days behind the microphone on Radio Biafra London, I can vividly remember hearing him say “I am not a career freedom fighter”. He made it clear to the world that the Indigenous People of Biafra IPOB have come to restore the blessed nation of Biafra in every truth and honesty. 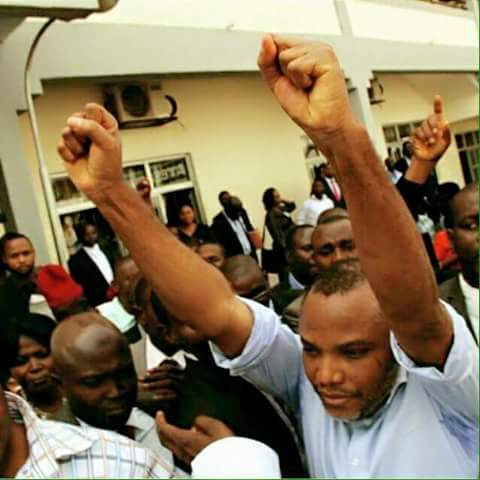 He categorically and unequivocally stated that the restoration of Biafra is imminent. Many people had thought that the restoration of Biafra will take a longer time; ten, twenty years or more, but it is unimaginable how fast it is coming; in a rather geometrical progression. Who would have thought that Nnamdi Kanu and IPOB will take the struggle for the restoration of Biafra to the level where people that matter in the world is discussing Biafra; international media houses are reporting Biafra. As a matter of fact, it is on record that Nnamdi Kanu, IPOB and Biafra make news headlines that occupies the front pages of newspapers in Nigeria and some foreign countries on daily basis to the extent that a media publishing company proprietor was arrested for reproducing Biafra Times news on hard copies. The proprietor of the company had this to say..." we reproduce Biafra Times publications because we discovered that Biafra news sells faster and more than any other news in Nigeria"
Today we have radio Biafra, Biafra TV, Biafra press, and media that is second to none. To crown it all, we have Biafra embassy in the basque region of Spain, from where the activities of the restoration of the nation of Biafra are controlled worldwide. Nnamdi Kanu is a freedom fighter who receives directives from (Chukwuokike Abiama) "God the creator of the universe", it is not in doubt that he was sent by God to salvage the Indigenous People of Biafra IPOB and Africa from servitude and the shackles of darkness called Nigeria, a concoction of the British empire to milk Biafra dry and obliterate its inhabitants. The restoration of the nation of Biafra is a project with a timeline; with Nnamdi Kanu and IPOB, I have no doubt that the restoration of Biafra is imminent. We have come to restore Biafra and Biafra we must restore in truth and every honesty, without fear or favor. "We are not career freedom fighters", is the utterance of Nnamdi Kanu and it is manifesting as Biafra is nearer than we envisaged.